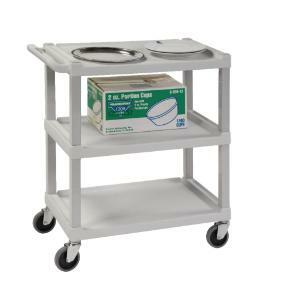 Cart features an integrated push handle and three shelves that are precision molded from high-density polyethylene to resist stains, odors, and dents. Note: Load capacity is the total cart capacity across all of the shelves with the weight evenly dispersed. Easy to sanitize. Color: beige. Ordering information: Ships unassembled. Unique leg design allows permanent snap-together assembly without tools.